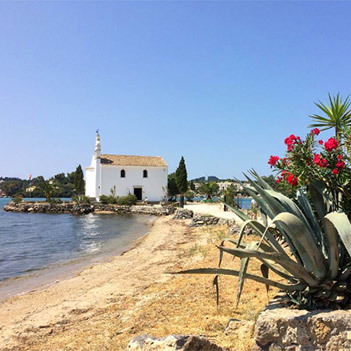 The historic church of Ypapanti is lying on its own islet, at Gouvia bay, near the peninsula of Kommeno. Due to the beauty of the scenery, it is ideal for wedding ceremonies and baptisms. The church of Ypapanti is like a small copy of the iconic Vlacherna Monastery. It is located in Gouvia bay, opposite the marina. 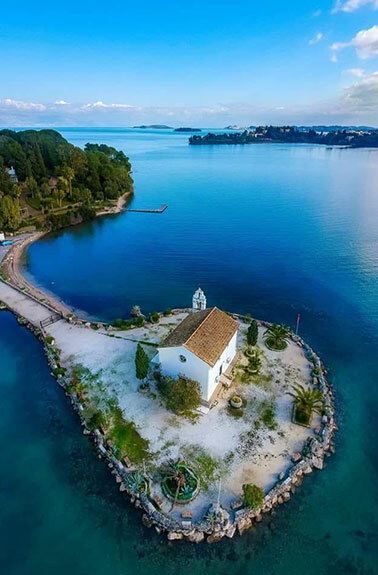 The church is located on a small island connected to the Kommeno peninsula, a green cape with scattered luxury hotels and villas. In the 17th century Venetian seamen selected the area of Gouvia as an ideal location for creating a naval station and shipyards, remains of which have survived in the region. Gouvia’s position in a natural harbor made it an ideal location for a shipyard, this was exploited during the Venetian occupation, when they built their arsenal in the village. The remains of it today are notable in the area. Located near the mouth of the Adriatic Sea, Corfu was a very strategic location for Venice and the Venetians built extensive fortifications to defend the island against incursions. In the aftermath of the second great siege of Corfu by the Ottomans in 1716, the Venetians, as part of their reinforcement of the fortifications of Corfu, built the arsenal to service their ships and also stationed their galleys at Govino Bay. The arsenal was also used as storage for the Venetian ships.